A twin bottom bunk or a pull out bed will let you sleep an additional person if you’re already sleeping 2. This comes in handy if there are a lot of visiting cousins. Sleepovers with cousins are one of the most coolest bonding experiences kids will experience while sharing jokes, stories and updates from new video games. Another benefit of kids sharing the same room is their sleeping routines. Instead of spending time in two separate rooms you can establish their bedtime ritual in one go. Triple sleeper will allow you to snuggle with your kid on the bottom bunk before they fall asleep while reading bedtime stories. You can even sit up on the edge of the bottom of the loft beds if you’re just there for a brief moment wishing them a quick good night. 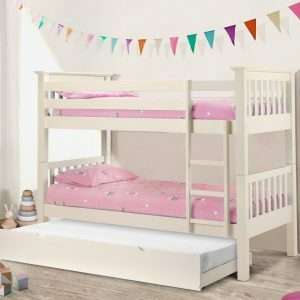 Whether you want to sleep 3 or have the 3rd sleeping place for the time when someone comes over to visit, the cost of getting a triple sleeper will be lower than 3 separate beds. Speaking about bonding, all parents should know that even though their kids will be in constant battle for dividing their territory, they will grow closer from spending so much time together. When the day is over and it’s time to go to bed they will always exchange giggles and stories that will be part of their secret world while growing up. When fitting their room don't put in TV units, game consoles, or anything else that would be better suited for a living room. Try to keep their bedroom layout simple and suitable for playing together and learning. An adult who shared a bunk bed with their brother recalls one of their childhood memories saying, “He used to put his hand down from the top bunk to the bottom double bunk and make me hold it because he was scared of the dark”. (source) It is the type of close connection that every parent wishes for their kids. It teaches them to respect other people’s boundaries and be supportive of each other from a very early age. It is easy to divide the space by installing a curtain that will help to block out the light if one of the kids is finishing their book when the other is trying to fall asleep. This idea comes in handy for all the kids that have a slight age gap. Lastly, a safety tip to keep in mind when it comes to the guardrail. Its height will be reduced once the mattress is in position. So make sure to keep an eye on the type of mattress you're buying so that the guardrail is high enough to provide safety even after the mattress is in place.